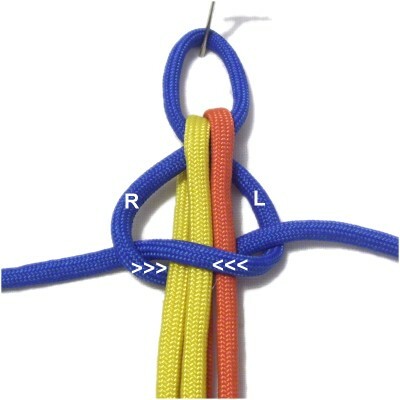 Description: The Ara Batur Bar is a unique Square Knot pattern featuring three colors. 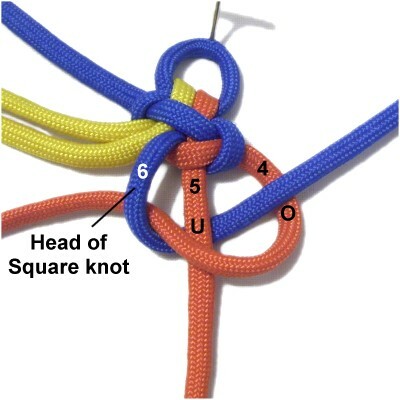 The heads of the knots face inward, forming a line down the center, and loops along the edges. You can use this type of knotted band to create a bracelet, belt, or other flat item. 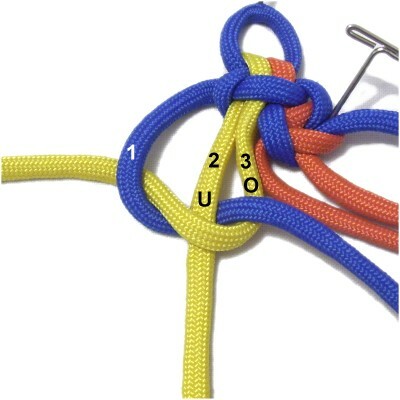 In the example shown, there is a loop at one end, which can be part of a clasp. You can start this design in the center of the cords, too. I recommend practicing with Parachute cord, which is the material you see in the example. 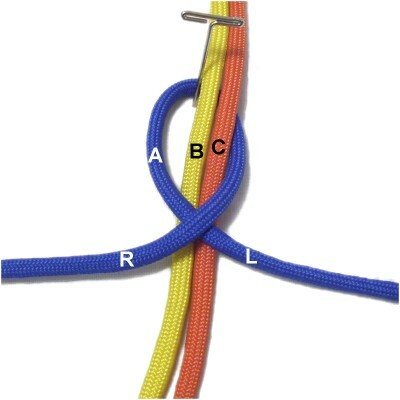 Make sure you know how to tie both LEFT and RIGHT Square knots. Ara Batur can be translated to mean Row Boat. Try to visualize the red and yellow loops as the oars, and the center area as the surface of the boat. The loops on the edges are the waves. 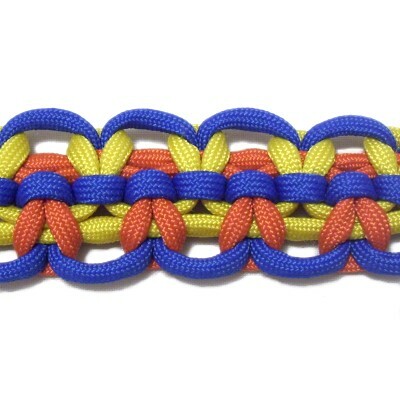 This design came from Fusion Knots. Click on this image or link to go to the site. 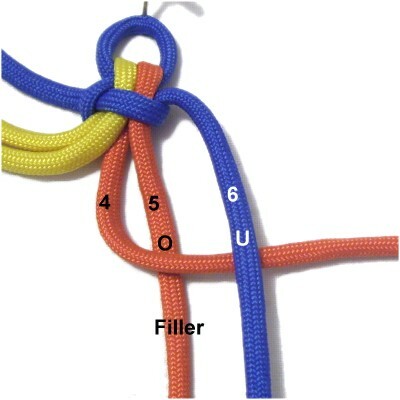 Be sure to view the video gallery, which contains tutorials for many unique decorative knots. To practice, cut three pieces of material, with one dark and two light colors. Using blue as the dark color is recommended. The cords should be at least 60 inches long. Prepare the ends to prevent unraveling. For Parachute cord, apply flame to the tips to seal in the core material. See Cord Preparation for more details. When using the Ara Batur Bar in a Macrame project, the cords should be at least 10 x the finished length you are aiming for. Step 1: Make a loop in the center of the dark cord (Cord A), crossing right over left. Arrange the other two cords through the loop vertically. The center of these cords should rest under the crossing point of the loop. Mentally label them cords B and C.
Fold the top half of cords B and C towards you (forward), so they rest on top of the crossed area of the loop. The fold should be at the center. Make adjustments if needed. Make the first half of a RIGHT SK by moving the left half of cord A over cords B and C, and under the right half of cord A (right to left). Move the right half of cord A under cords B and C, and over the left half of cord A (left to right). Step 1, continued: Before tightening, adjust the size of the loop. It should be at least 1/2-inches in size, depending on how you plan to use it. When using the Ara Batur Bar to make a bracelet or belt, the loop should be the size of the button knot, bead, or button you will add at the opposite end. Steps 2 and 3 below show you how to tie all the LEFT SK in the Ara Batur Bar, which are on the right. 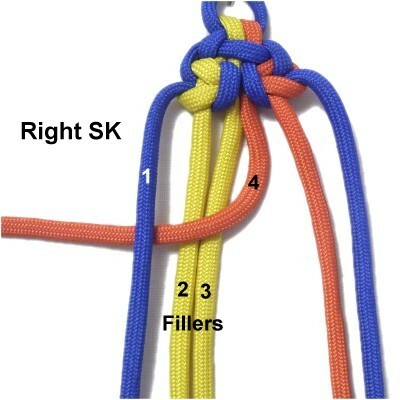 Steps 4 and 5 show you how to tie all the RIGHT SK, which are on the left. The heads of the knots will be facing inwards (towards each other), which is what makes the line down the center of the bar. 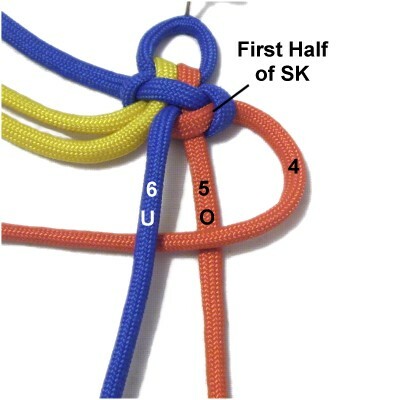 Please note that for the first two knots, there will be only one filler for each SK. Later on, there will be two. Cord A (blue) should be numbered 1 and 6. 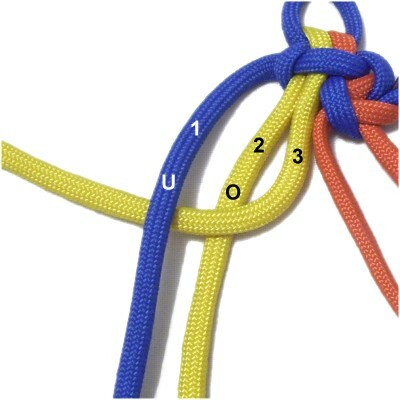 Cord B (yellow) is numbered 2 and 3. 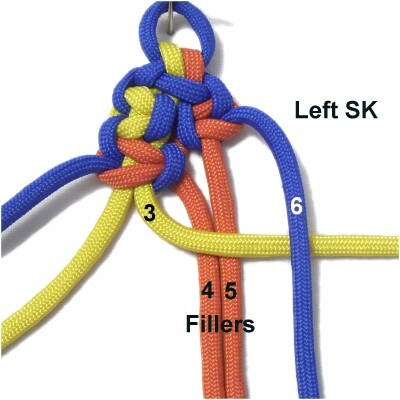 Cord C (orange) is numbered 4 and 5. Step 2: Move cord 4 to the right, over cord 5 and under cord 6. Cord 5 is the single filler for this LEFT SK. Move cord 6 to the left, passing it under cord 5 and over cord 4. This completes the first half of the Square Knot. Pull on the ends to tighten it firmly. Step 3: Move cord 4 to the left, over cord 5 and under cord 6. Move cord 6 to the right, passing it under cord 5 and over cord 4. Tighten the second half by pulling the ends firmly. 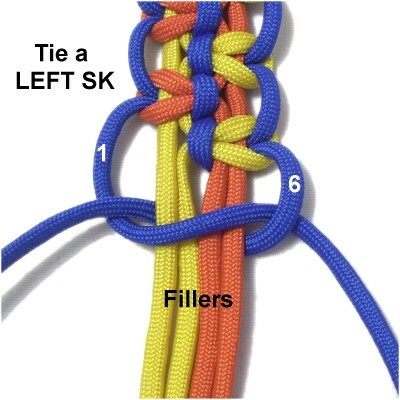 The segment indicated (cord 6) is what forms the head of the SK, which faces left. Step 4: Now it's time to tie the first RIGHT Square Knot for the Ara Batur Bar. Move cord 3 to the left, over cord 2 and under cord 1. The single filler is cord 2. Move cord 1 to the right, passing it under cord 2 and over cord 3. Tighten the first half of the SK firmly. Step 5: Move cord 3 to the right, over cord 2 and under cord 1. Move cord 1 to the left, under cord 2 and over cord 3. Tighten the second half of the SK firmly. 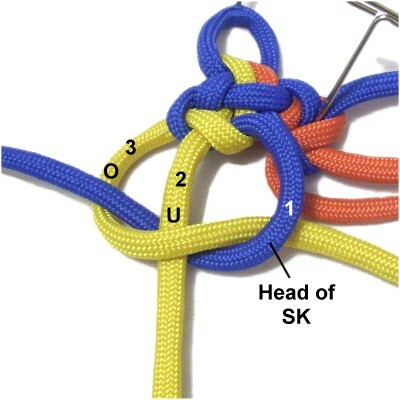 The segment of cord 1 on the right forms the head of the SK, which touches the head of the other knot. You can see that in the next image. The primary design for the Ara Batur Bar is a series of Square Knots that share cords. Each knot has two working cords and TWO fillers. Use the information in steps 2 - 5 to make the right and left SK. You will be using different cords, but the process is the same. Remember that the head will face the direction of the first working cord you move, which is what is shown in the next two images. Step 6: Use working cords 1 and 4 to tie a RIGHT Square knot. Cords 2 and 3 are the fillers. Pull the fillers so they are straight after tightening the knot. 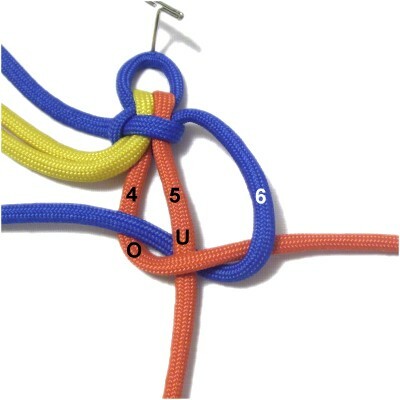 Step 7: Use working cords 3 and 6 to tie a LEFT SK. The fillers are cords 4 and 5. 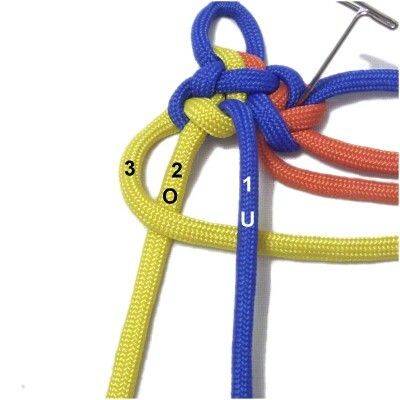 Notice how cords 3 and 4 are part of both knots (shared). Pull the fillers straight after tightening. Step 8: Repeat steps 6 and 7 several times, until the Ara Batur Bar is the size you want. Stop on step 7 (Left SK). 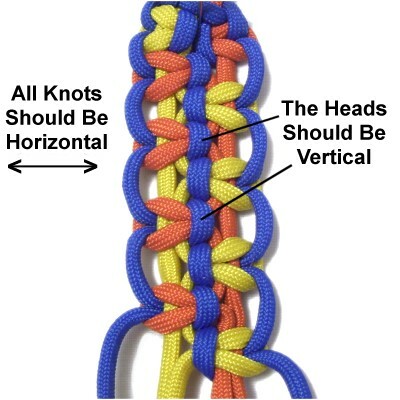 The knots should be horizontal and the heads vertical, so they form a line down the center of the design. 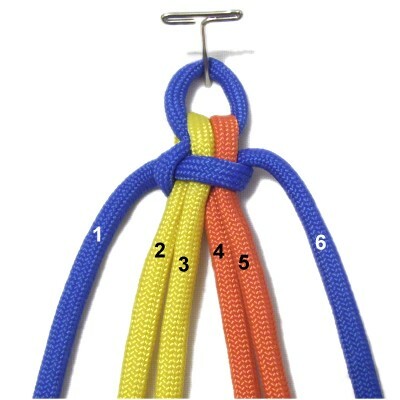 Step 9: The best way to complete the bar is to tie a LEFT Square Knot using cords 1 and 6. The other four are the fillers. This step is optional, if you are just practicing. Turn the bar upside down, so you work in the back. 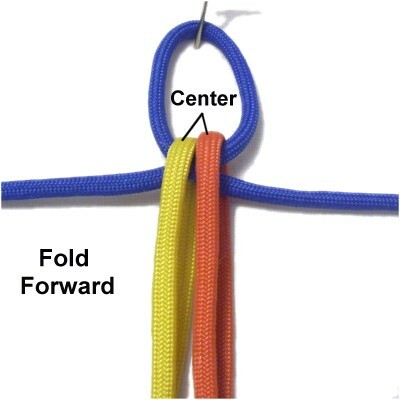 Fold cords 1, 6, 4, and 3 to the back, and pass the end of each one under a loop. Apply glue to secure them, and cut off the excess material when it's dry. Attach a button or bead, or tie a button knot with cords 2 and 5. 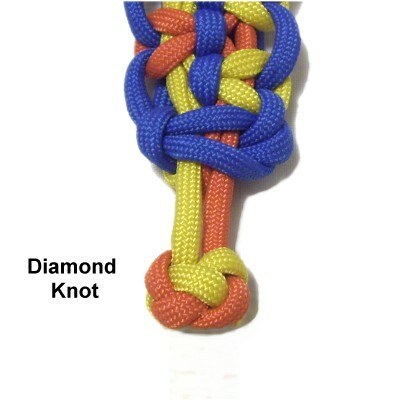 The Diamond Knot, which is called the Knife Knot on this site, is the best button knot to use, since it can be made with two cords. Cut off the excess material after tightening. This is the completed Ara Batur Bar, showing the details. 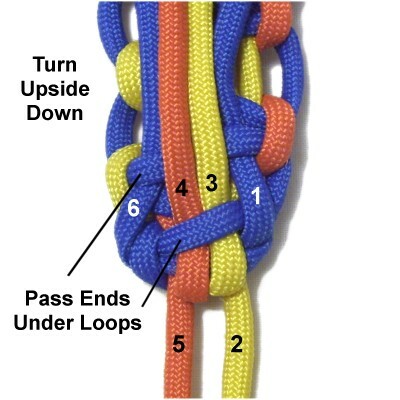 The loops along the edges are the waves, and the oars are the orange and yellow portions of the knots. The straight portion is the boat. Have any comments about the Ara Batur Bar? Contact Me.